Are you looking for a secure source of fixed income for now or your future? You may be tired of living at the mercy of the fluctuating stock and real estate markets. One solution is a charitable gift annuity. Gift annuities are a wonderful way to support our mission and provide you with a consistent lifetime income that will not fluctuate. Gift annuities are particularly useful if you desire a fixed and guaranteed income stream and have assets that produce little to no income or return. What's better is that as annuity payout rates are set by age, the older the income beneficiary, the higher the fixed payment you will received. 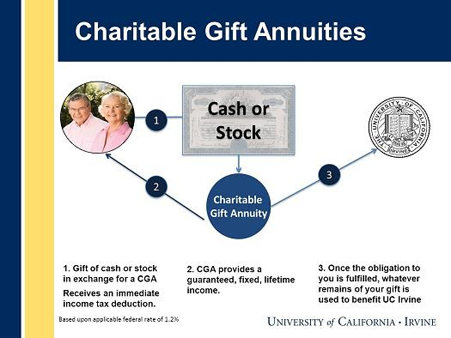 A charitable gift annuity (CGA) is a simple contract that you establish between yourself and the University of California. In exchange for a gift of cash or publically traded stock, the University agrees to make fixed payments to you for the remainder of your life. Once the University's obligation to you has been fulfilled, the remains of your initial gift are used to further the University's mission in an area that you designate. If you desire current income, you may transfer property in exchange for our promise to pay you fixed income beginning as early as this year. You will receive an immediate income tax charitable deduction for the value of your gift to University of California, Irvine. A charitable gift annuity is a contract between you and University of California, Irvine. You transfer property to us. In exchange, we pay you a fixed income for life. The payout amount can be quite high, depending on your age. You will receive a charitable deduction for your gift of the remainder to University of California, Irvine and the satisfaction of furthering our mission.